Sold by Tribesigns-Way to Origin and Fulfilled by Amazon. Gift-wrap available. 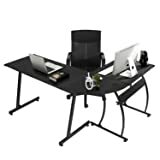 Amazon's Choice for "modern office desk"
Sold by Tribesigns-Way to Origin and ships from Amazon Fulfillment. Solid and holds up well -the wooden top is thick and solid, it's beautiful,very easy to put together, just attach legs and struts. Adjustable leg pads design, the desk leg can adjust 1-2cm lengths, made the table keep stable even on uneven floor. 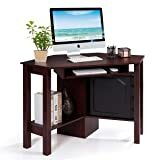 This desk can be used as computer desk, office workstation, meeting desk, study table, writing desk, gaming desk etc. 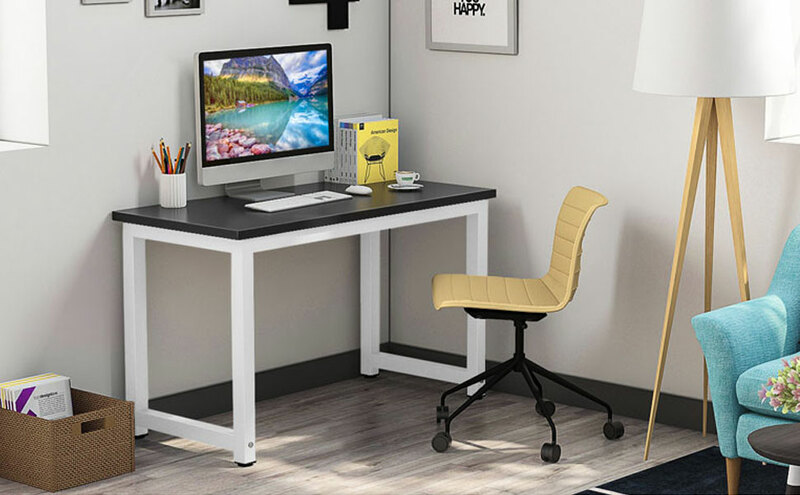 Personalize your home office ●with this functional desk. 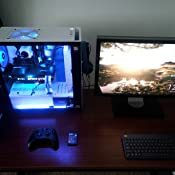 Height from floor to desktop: 29.2"
4.0 out of 5 starsGreat but not what I expected. First off I will start by saying this a great table for the price. 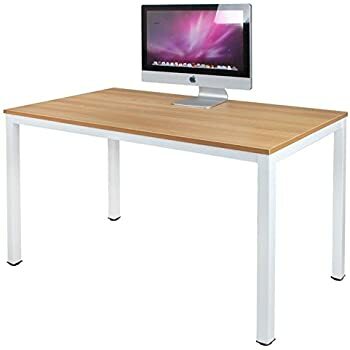 When I was searching for a computer desk I wanted something sturdy and this desk is most definitely solid. I would have no concerns of jumping up and down on it (not that I would ever do that). The packaging was decent, there were some scuff marks on the metal legs and some scratches in the white paint, nothing too bad.. Easy to assembly, the instructions were laughable but honestly they aren't even needed, it's basic and simple. The cons that I have are the size and the table top material. 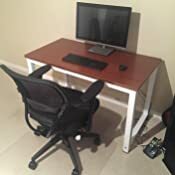 Even though the description does list the measurements I still thought this would be a decent size desk for my computer and chair. 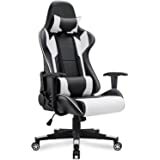 As you can see in the picture my chair looks monsterous in comparison. For what I need, the desk is a bit small but I suppose that's my fault because the measurements are listed accurately on this site. My second issue is the textured "wood" top on this desk. Obviously that's not a real slab of wood but they made it have a wood texture feel and this makes it impossible to write on a piece of paper! I didn't expect that, it looks nice cosmetically but don't plan to write with a pen and paper on this thing.. 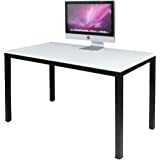 It's a solid desk, easy to assemble, will last a long time. Make sure you have an understanding of the dimensions. 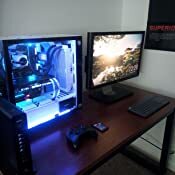 5.0 out of 5 starsNice size desk!!! This is a really nice size desk. 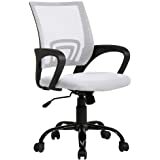 Very easy to setup and very sturdy. The legs are made of metal/ steel. 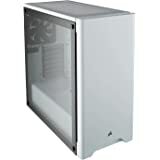 I can fit my monitor, keyboard, router, and my gaming PC. Checkout the pics I attached. I love everything about this product. Package was secure without any damage to the product. Very easy assembly. 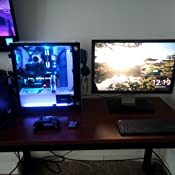 Took less then 20min to put everything together. Very stable. 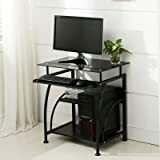 I was looking for a corner desk but this one is more then perfect for my use. 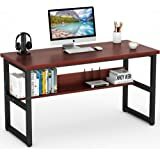 I would recommend this product to anyone looking for a nice urban style computer desk. it came with no defections. easy to install. make sure when youre putting the legs together the whole matches on top they have to be facing each other. 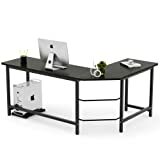 I purchased the Black top with black legs 55" desk from Tribesigns-Way to Origin. The desk is very spacious and came in a VERY large and VERY heavy box. The space across the top of the desk is perfect for my needs; however, the actual height of the desk was not. I am 5' tall, which means my torso and arms are proportionate to my body; therefore, the desk ended up being way too tall for me. The measurement of the desk from the top surface of the desk to the floor is correct on the website description; however, this fails to mention the supportive metal bars that are underneath the top wood. 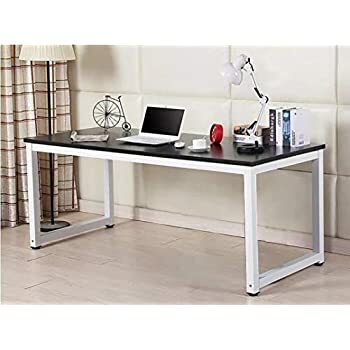 The metal bars underneath the desk makes the overall height of the desk shorter. I found my thighs brushing up against the metal bars and my arms straining to stay in a raised-shoulder 90 degree angle while sitting. 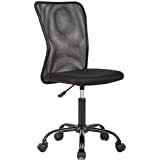 I had to adjust the height of my chair to sit as close to the metal bars as possible in order for my arms to even lay flat on the surface of the desk while doing computer work on the desk. This was very uncomfortable. The actual height of the desk from the floor to the metal bars supporting the top of the desk is 26.5 inches. Lastly, since the desk was shipped using freight shipping, it arrived damaged, like other reviewers have stated. The corners of the desk I received was ripped off and you can see the particle board underneath. For this reason, as well as for the height issue, I returned it. 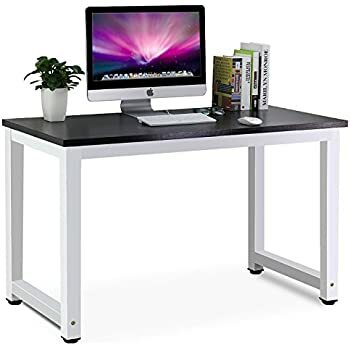 Now, I purchased this from Tribesigns-Way to Origin and although it took them about 2 weeks to process my return request, they refunded me $100 (I paid a total of $129.99 for the desk) without me having to ship the desk back. 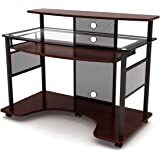 I ended up donating it to Goodwill instead, which is a good thing as I did not want to deal with the hassle of having to drop this off at UPS since it is a very heavy and large desk. I do want to note that Tribesigns-Way to Origin initially gave me a $70 refund deal and when I gave reasons as to why I was returning the desk, they increased it to $99 until I settled with a $100 refund. Tribesigns-Way to Origin is a little sketchy to deal with when it comes to returns, but at least you get most of your money back. PERFECT! 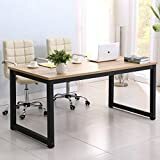 I have been looking for a decent-sized/spacious desk that is STURDY and 'nice looking'. 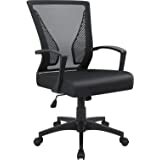 I must have saved 50 different desk options weighing pros and cons and reading reviews. And I am beyond pleased with this desk. Easy to put together but also super sturdy. I did have to adjust one of "leveling feet", but that is why they are there! 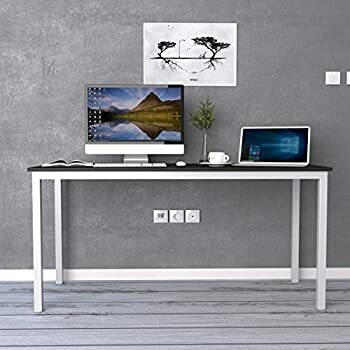 This desk is super sleek and nice looking. Of course I could always put a larger desk to use, but this size is what I needed for limited space options in our townhome. And is. If enough for my laptop + second monitor, and free desk space to write/work. Dimensions are provided, and accurate. I especially love the space underneath, giving me plenty of leg room and also space for an under the desk storage cart or shelf if I want some extra shelving/storage. I am so thrilled to have bought an item online that was true to its specs and reviews. And packaged very well, and not-damaged. I was nervous about buying such a large piece of furniture online since it would be such a hassle to return or exchange if it was not quite right; but no need to worry as the piece was exactly what I expected & true to its descriptions. Great desk. Very solid and simple. Mounted 2 24 inch monitors and still plenty of room. 5.0 out of 5 starsIt's sturdy and moden. Exactly what I expected. 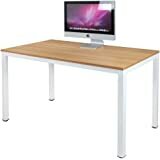 This desk is amazing simple to put together, just the right size and amazing quality. I'd recommend to anyone who is looking for a modern sturdy desk.